Vivienne holds a Bachelor degree (BA) in Social Sciences from the University of Aachen. She is currently enrolled in the masters programme of Political Sciences at the University of Cologne. 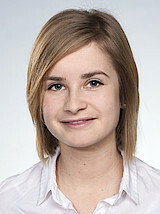 She did internships at the Federal Ministry for Economic Cooperation and Development, the Eine-Welt-Forum Aachen e.V. and worked as a Student Assistant for the Institute for Automotive Engineering (ika) of RWTH Aachen in the public relations. Vivienne works as a student assistant, supporting Marc von Boemcken in the Project “Radicalization prevention in North Rhine-Westphalia”.